A complimentary of healing foods that will help her back on the road to recovery: gourmet bowtie chicken soup, light crackers, teas, delicate tea cookies, and a lovely teacup with matching saucer. Get well mylar balloons are available to help you send messages of good cheer for a speedy recovery. 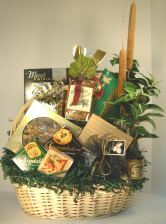 This dazzling gourmet food basket enhanced with silk flowers and berries, is beckoning to be shared with others. It is overflowing with and extensive selection of delicious foods: cheese and crackers, chocolate cherries, pecan roll, Starbucks coffee and biscotti, gourmet popcorn, cheese sticks, salmon fillet, nuts, and more.